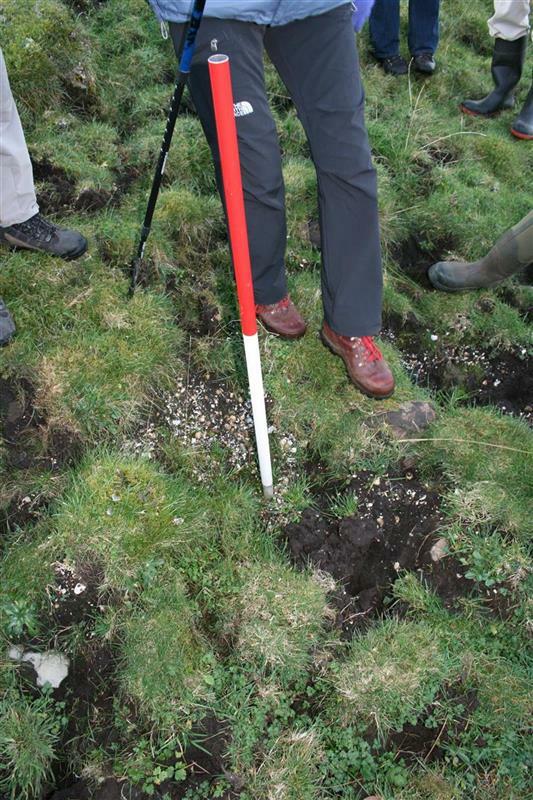 Open air midden site investigated by the Scotland's First Settlers Project. It was radiocarbon dated to the 13th century. The following sites were recorded between January and September 1999 as part of the Scotland's First Settlers Project. A full report has been lodged with the NMRS. NG 6871 2424 Ashaig 1 This substantial shell midden is associated with the ancient cemetery and lies inside (Ashaig 2, MHG55545) and outside (Ashaig 1) the cemetery wall. A 1 x 0.5m trench was opened in Ashaig 1. Midden material was extensive, consisting of approximately 90% periwinkle with occasional fragments of animal bone and limpet shell. Coring with a post auger established that the site continued about 1m eastwards from the test section and suggests that the midden is extensive. This site was investigated as part of the Scotland's First Settlers Project in 1999. It comprises a substantial open shell midden associated with an ancient cemetery. One test pit (1m×0.5m) was opened to assess the depth of midden deposits. There were three lithic finds from Test Pit 1, all were debitage, two pieces of baked mudstone and one of quartz, 15.9g unclassified ironworking slag, oyster, limpet, periwinkle and cockle. Three radiocarbon dates were obtained which all indicate activity in the 13th century AD (AD 1215-1290; AD 1220-1390; AD 1210-1295). See link below to online published report for radiocarbon dates. See also link below to Scottish Radiocarbon Database. Shell midden between enclosure wall of cemetery, to east of postulated chapel site, and Tobar Ashik. <2> Collection/Project Archive: Archaeology for Communities in the Highlands (ARCH). 2012. Digital site gazetteer and archive for ARCH Community Timeline Project: Broadford. Yes. Digital. Site 33.